The Neo Blademail is a membrance gaming keyboard with 104 keys. The sturdy metallic plate, splash proof function and RGB backlight makes it the perfect first gaming keyboard. 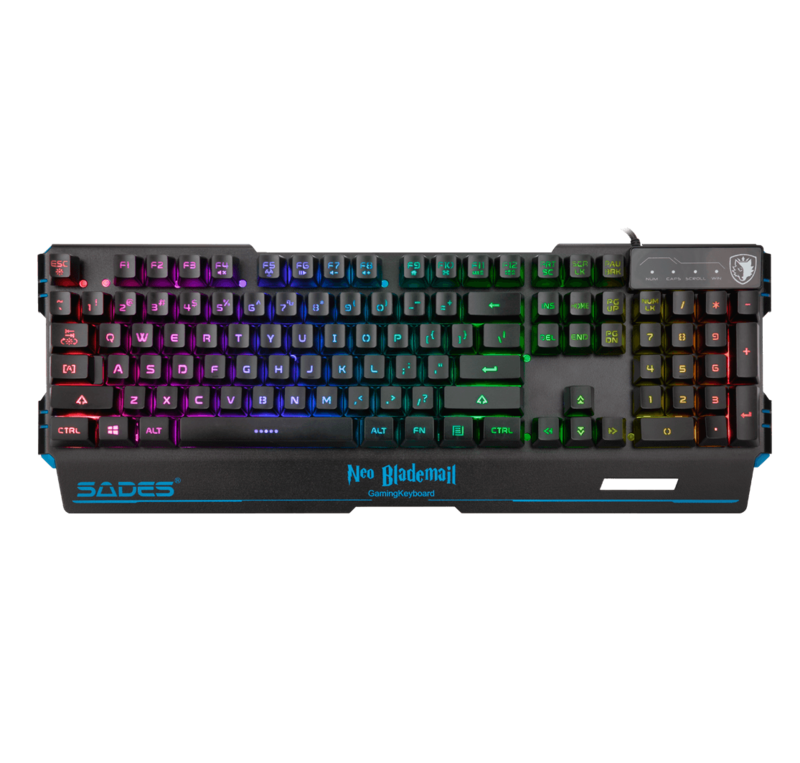 This gaming keyboard is built up with metallic plate and tough plastics, making it sturdy enough to use for a long time. The floating keycaps is used to providing mechanical-similar typing experience. Color injection modeling process on keypads ensure the character never fad away. Neo Blademail has 5 RGB backlight patterns: static backlight illumination (7 colors available), pulsing rhythm illumination (7 colors available), RGB floating illumination, column changing illumination and full backlight color cycle change. Press FN+Num Key (1-7) on the typing area to select color for static backlight illumination and pulsing rhythm illumination, red/yellow/green/cyan/blue/purple/indigo appear in order. FN + F3-F12, provides multimedia controls for media player, email, calculator, webpage, all keys lock and Win lock. FN+F4-F12 – multimedia controls for media player, email, all keys lock and Win lock.